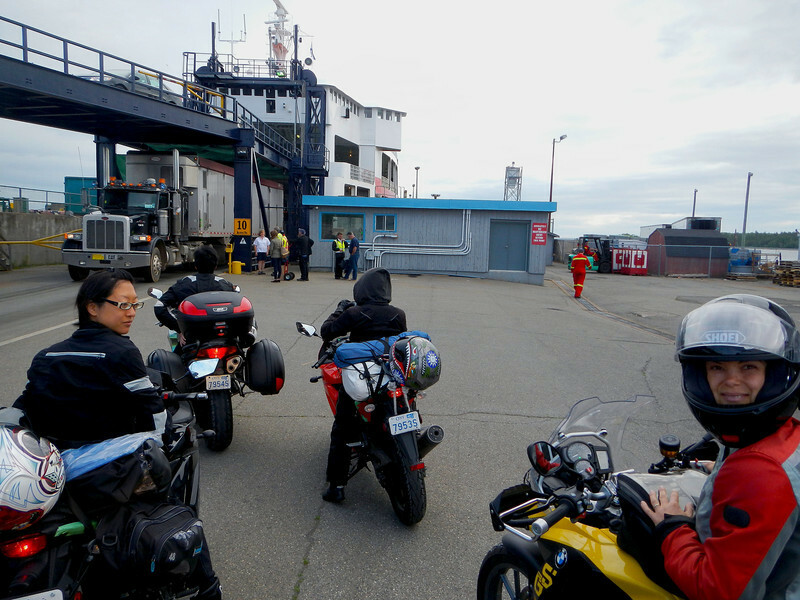 We woke up early to catch the early ferry across the Northumberland Strait from Caribou, NS to Woods Islands, PEI, about 75 minutes from dock to dock. The only thing I knew about PEI was that we grew a lot of potatoes because of the fertile red earth. 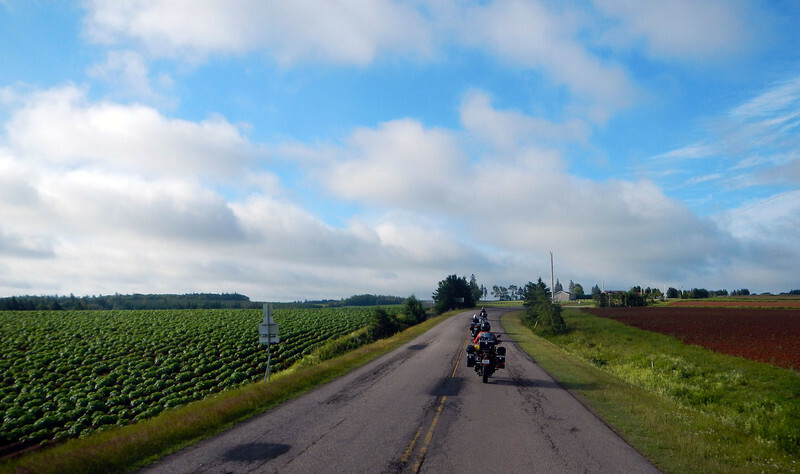 We spent most of the day riding around the coast of PEI. Unfortunately, the "scenic" route was a bit inland from the coast so the scenery consisted mainly of road and tree. We broke a bit from the scenery a bit to visit a lighthouse on the north-east corner of the island and to have a quick lunch. During a gas stop, an attendant asked us if we were all here for Atlanticade. We had no idea what that was. 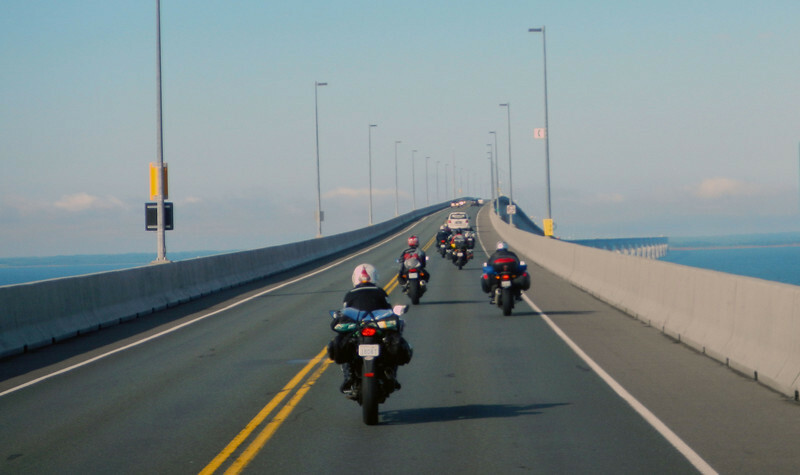 Apparently this weekend, over ten thousand bikers would flock to PEI to cross the Confederation Bridge to raise money for MADD. The rally centre was Summerside, just a half hour away from our campsite that we were staying that night on the north shore. Again, our hectic East Coast schedule prevented us from staying the weekend. This pace was not what we wanted for our real trip and Neda and I agreed that we would take every opportunity to dawdle and lag to our heart's content when we wrapped things up in Toronto. After lunch, we rode down to Basin Head, just outside Souris, PEI where we heard the sands sing when you walked along the beach! And they did! A loud squeaking noise as we shuffled our boots up and down the sandy shore. The sound occurs when the quartz sand is very rounded and spherical. As it rubs against each other, it makes a distinctive squeaking noise like you're rubbing two pieces of wet rubber together. Irene and Mel singin' in the sand - Photo by Ed C.
Neda has bad allergies to the mosquito bites at all our campsites, so she's taking Reactin to counter the swelling. Unfortunately, the non-drowsy medication is making her drowsy (happens in a small percentage of people). Not good when you're on a motorcycle! 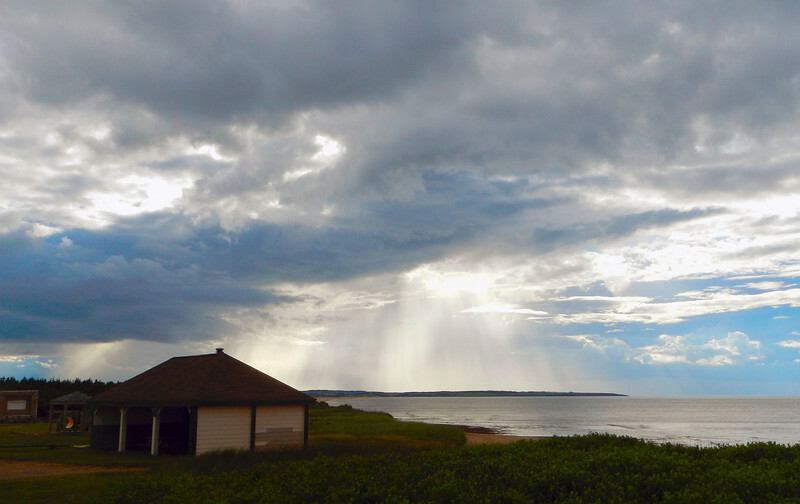 We set up camp on the north shore just outside Cavendish, as dark rainclouds rolled in. We've never put up our tent in the rain yet, and we were hoping to get the fly up before the waterworks started. As it turned out, we watched the rain fall from the comfort of an all-you-can-eat seafood restaurant, our tents already battened down. The view from our tentsite: morning sun on the north shores of PEI. Glorious! 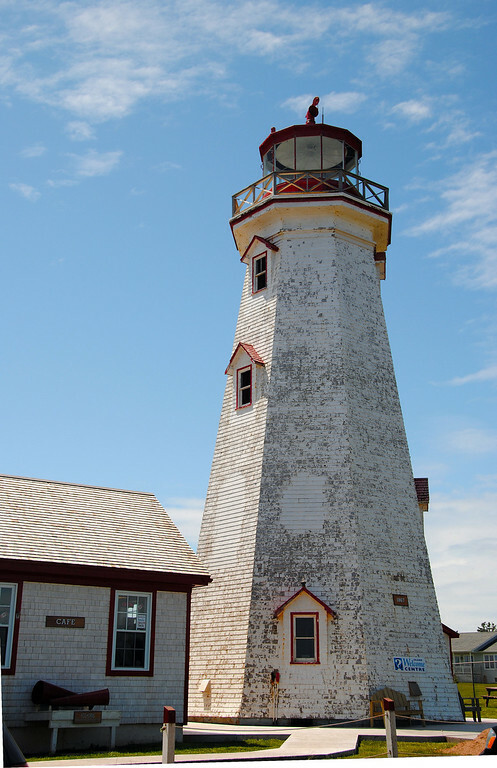 The next morning, we rode out of PEI via Confederation Bridge to New Brunswick. The 13 kms bridge's claim to fame is that it's the longest bridge in the world to cover ice-covered waters, not that there were any on this warm late July day. The Atlanticade motorcycle rally was set to ride this bridge a couple of days from now, and I could just picture 12,000 motorcycles riding back and forth. A lot of tired left arms waving to that many motorcycles! 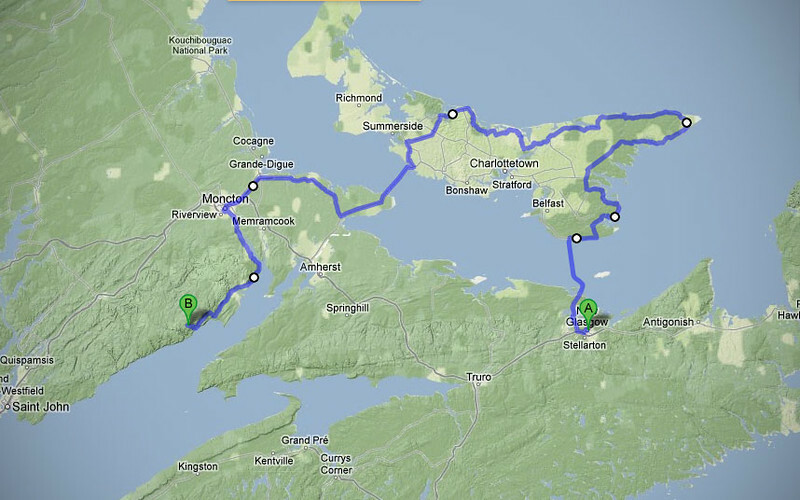 We're spending a bit more time in New Brunswick on our way back to Ontario. This is truly the only bilingual province in Canada, almost everyone we meet along the way here speaks both languages fluently. 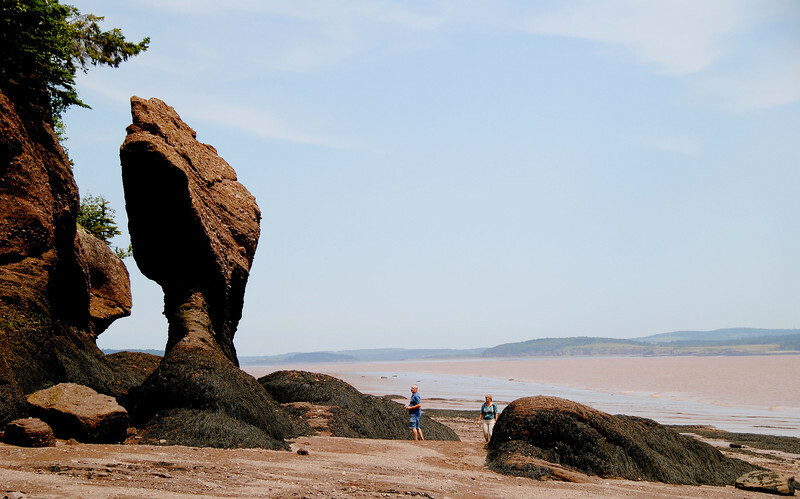 Like PEI, I didn't know much about NB before coming out here, but what we really wanted to see were the Hopewell Rocks located in the Bay of Fundy, the inlet of water that's shared by New Brunswick and Nova Scotia. 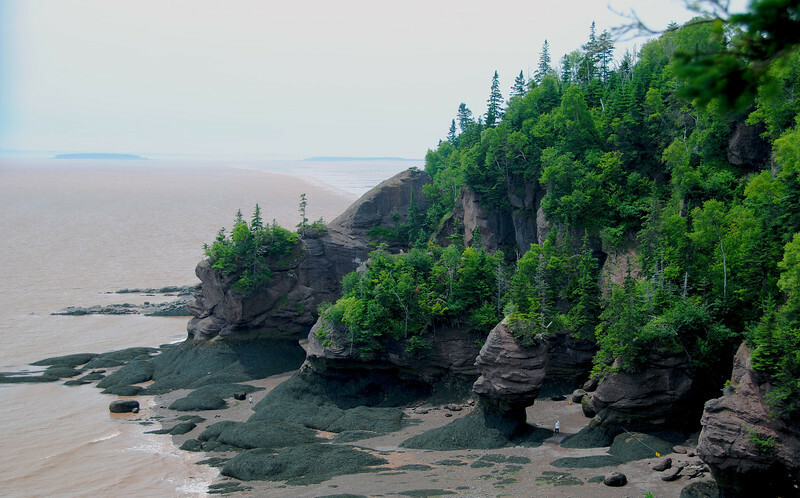 The Bay of Fundy is home to a unique phenomenon - the largest tides in the world. Over 100 billion tonnes of water flow in and out of the bay during each tide. And the tides happen twice a day, high and low tides occuring every 6 hours and 13 minutes on average! The tide differential may be anywhere between 10 to 14 meters! 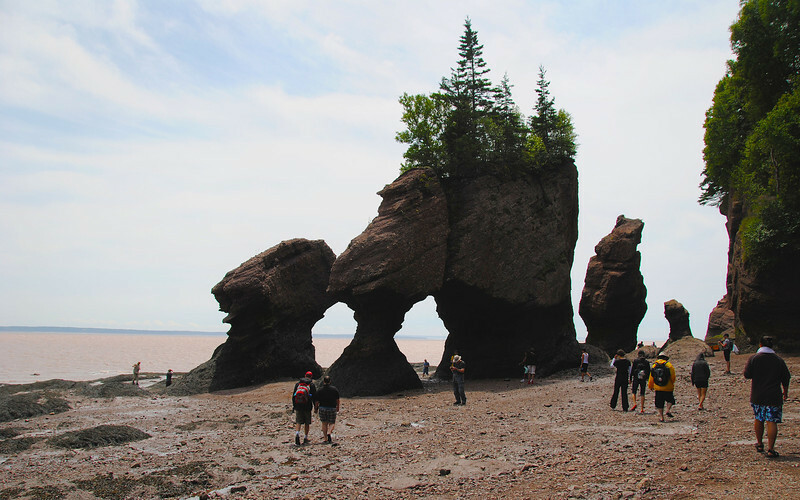 These bizarre rock formations called flowerpot rocks, are created by the erosion of the twice-daily tides. The larger heads of the rocks are the parts untouched by the high tide. 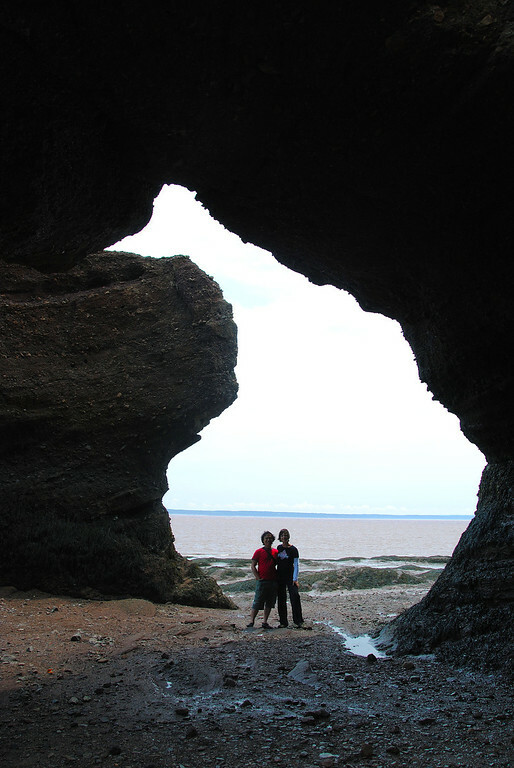 During low tide, it is possible to walk on the sea-floor and between the flowerpot rocks. 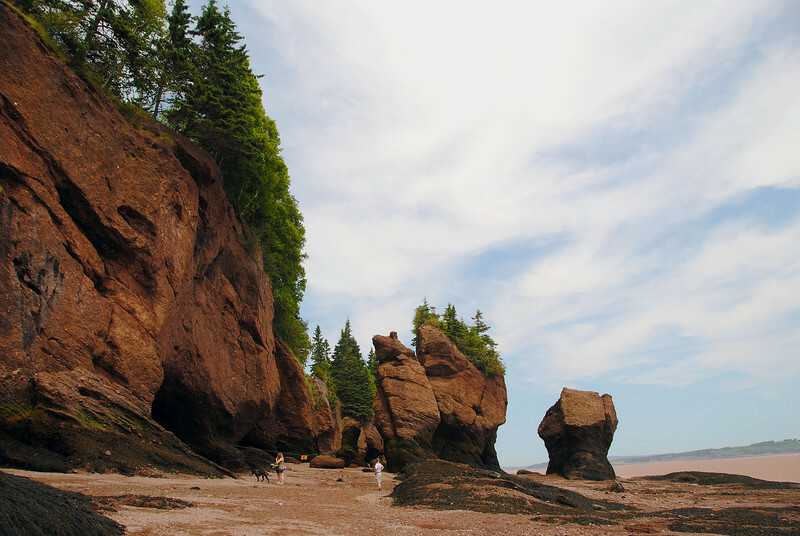 When low tide is not low enough to walk the floor, visitors often rent kayaks and canoes and paddle around the rocks. Very beautiful to see! There are signs posted all over to be back on shore before high tide hits Hopewell. If you find yourself out on the rocks during high tide, the only options are to wait the 6 hours until the tide washes out, or swim back to shore!